After a retreat led by Dave and Joan at St. Peter’s in March, it was decided a return visit must be planned for the fall when they would be back in Indiana. Thankfully everything fell into place. This time presentations are scheduled to include the parish, school, religious ed program, and families. This popular, captivating one-hour multimedia presentation takes a leap into the mystical life of St. Faustina and her encounters with Jesus, The Divine Mercy. The fullness of the Catholic faith is expressed through the words of Jesus as recorded by St. Faustina, with emphasis on the reality of Christ’s true presence among us today, particularly in the Sacraments and also by means of the veneration of His sacred image. All are amazed to learn of and see the correlation between the original Image of The Divine Mercy and the Shroud of Turin, a highlight of MOMM presentations for 20 years. Holy Hour – As a registered location in the nationwide Rosary Coast to Coast event on this Feast of Our Lady of the Holy Rosary we will be praying for our country along with tens of thousands across the land. 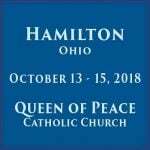 The Holy Hour will include songs, prayers from the Diary of Saint Maria Faustina Kowalska, the Holy Rosary, and the Chaplet of Divine Mercy. Visit the Rosary Coast to Coast website and register your location here. View the powerful Rosary Coast to Coast video here. View Fr. Don Calloway, MIC speaking about the Rosary Coast to Coast here. 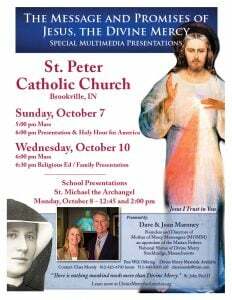 All are welcome to these presentations, which are similar to the “Spark from Poland” given on Sunday but geared toward the age group present. By dividing the age groups, a more targeted interaction is possible, particularly with the older students. Presentations conclude with the recitation of the Chaplet of Divine Mercy. Each classroom will be given a FREE 11 x 14 Divine Mercy Image. Each student will receive a BLESSED 5 x 7 Divine Mercy Image to take home. Accented with a blank ribbon, this image is designed for the student to fill in “Jesus, I Trust in You” on the bottom of the card, allowing them to make a personal commitment to trust in the Lord. Parents are encouraged to attend with the students so that the entire family may benefit. This presentation is similar to the “Spark from Poland” given on Monday evening but geared toward the students. Time will be adjusted to fit class time. Concludes with the recitation of the Chaplet of Divine Mercy. All students will be given a 5 x 7 Divine Mercy Image as above. Parents will receive a Divine Mercy holy card with the Act of Consecration of the Family to the Divine Mercy on the back. Appropriate for all ages. MOMM is an apostolate of the Marian Fathers at the National Shrine of The Divine Mercy in Stockbridge, Massachusetts. 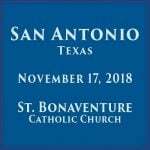 Since 1999, from their home/office outside of San Antonio, Texas, Dave and Joan have traveled with the Divine Mercy message visiting more than 800 parishes, schools, and conferences with their highly acclaimed multimedia presentations sparking spiritual growth and parish renewal all along the way.